Available in extruded aluminium profile casings with plastic corner. Multiple layers of mono filament synthetic woven fabric of suitable mesh size and mono filament thickness stitched with an aluminium expanded metal reinforcement is used as the filtration media. In cases where necessary, aluminium pipes rigidly fixed to the casing with PPCP studs at each pleat act as pleat supports. 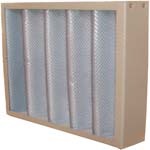 Pleated media for enhanced surface area, higher dust holding, higher air handling capacity & lesser pressure drop. Epoxy or PU sealants to bond casing to the filtration media. Water washable (Refer "Handling and Servicing" instructions). 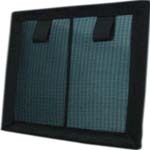 Non woven synthetic fibre filtration media in Hi-loft or Needle punched fabric with suitable covering and aluminium expanded metal reinforcement is used as the filtration media. 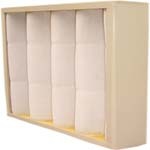 PU foam and synthetic water based adhesives to seal media with casing. Air cleanable (Refer "Handling and Servicing" instructions). Combination of flat and corrugated layers of metallic meshes of varying mesh sizes and wire diameter is used as filtration media. 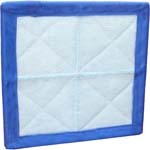 Can be used as a dry filter or as oil wetted filter. 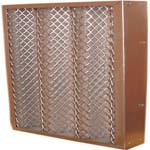 Can be used in series with a louver filter to improve life and performance. Options of GI and stainless steel wire meshes available. 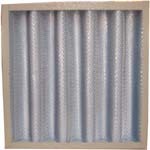 Most suitable as paint booth exhaust filters and kitchen exhaust filters. 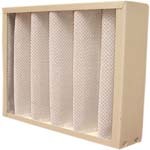 Multiple layers of Stainless steel or fibre glass mesh or fibre glass tissue are used as filtration media. Casing is usually stainless steel. 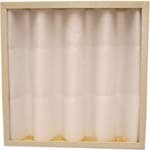 Suitable for use as pre filters in paint baking ovens and dryers.